The play that brought the murderous, sadistic regime of Augusto Pinochet to the New York stage was Ariel Dorfman’s Death and the Maiden (1990). In it, Dorfman, who had been an advisor to President Salvador Allende before the military coup in Chile, imagines a chance encounter between a former political prisoner and her captor – who repeatedly raped her during her detention – many years after the facts. Although the story is set in an unnamed country after the fall of an unnamed dictatorship, the source of Dorfman’s inspiration was never in doubt, and for Chileans, the prison where those fictional events would have taken place needed no mention either: the Villa Grimaldi, the country’s most notorious interrogation and torture center. 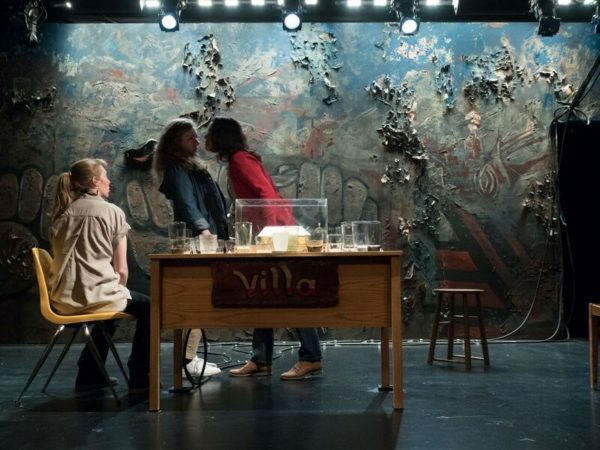 Now the Villa Grimaldi gets its own play, Villa, by the Chilean playwright and director Guillermo Calderón, who brings his fourth play to New York (after previous invitations to The Public Theater and Under the Radar). No longer a mere detail of setting, this former estate that became synonymous with the most sordid abuses of the Pinochet dictatorship, sits front and center on the stage, in a 1/25 scale model, and is the subject of the heated, even violent debate that is the play’s sole action, asking: what to do with the Villa Grimaldi today? Today, in fact, the site is a “Peace Park” dedicated to the memory of the 4,500 people detained there in the 1970s, hundreds of whom were also “disappeared,” so the question has been answered (with the help of Calderón, who wrote the visitors audio guide). The play, however, gives space to the debate that took place in Chile, before the park was created, over how to memorialize the site, once it became known that the property was sold to a developer with plans to build a housing complex. And although the buildings had already been demolished before community support for a memorial got off the ground, Calderón imagines all the possible scenarios that could have been advanced, including some that were: recreate the detention facility? build a heritage museum? make a green space? a single-family home? or do nothing and leave it for nature to reclaim? That promises to be a fraught decision, the kind that community boards were just made to lock horns over. In Villa, three young women have been given the daunting task of resolving it – precisely because the board chosen to do so has dissolved into a hateful, screaming mob – and each champions one of those scenarios for the other two, as a pure debate exercise. Described that way, Villa could sound like a throwback to the théâtre d’idées of the early 20th century, with its philosophical and moral imperatives. But Calderón writes with a passion inflamed by the Pinochet years, which marked his family’s history, and a mean streak of dark humor. The play’s premise – the absurd encounter of these three random women and their task, which condemns them to endlessly debate an unresolvable question – may reference Pinter and Beckett, but its subject wrestles with the problem central to Death and the Maiden: how to live in the aftermath of such abuses? Villa’s characters really struggle, intellectually and emotionally, with those questions, and with good reason; the original Spanish-language production of Villa was created as a site-specific work to be performed at Chile’s many detention centers from the Pinochet era, including the Villa Grimaldi. This US premiere by The Play Company, which Calderón directs, is the first time Villa is performed in a theater, rather than in a detention center. It consequently has the challenge of translating the context for American audiences. Images of the Villa Grimaldi and Santiago de Chile, where bodies are carried in the muddy, roiling waters of the Mapocho River, are projected on a wall of the Wild Project’s lobby, pre-performance. The excellent trio of actresses formed by Crystal Finn, Vivia Font and Harmony Stempel, as the three “Alejandra”’s chosen to decide the fate of the site, put heart and soul into making us feel the enormity of their task. Still, where the play will connect with audiences in its US run is through its writing – Calderón’s flashes of absurdity, irony and wit – more than through its problem of historical memory and national reconciliation (although Villa’s premise might call to mind the discussions about how to memorialize the 9/11 attacks on the World Trade Center, the two sites are vastly different symbols in their respective countries). A running reference to the Mapuche indigenous people (with long-running grievances against the Chilean government concerning territorial sovereignty and cultural identity), may open Calderón’s concerns to larger questions of democracy or refer to specific incidents of oppression during the Pinochet regime, but the subtext is not elucidated here. Nevertheless, we get a shrewd, engaged play in a passionate production. The three scenarios argued by the Alejandras are: a “house of horrors,” an ultramodern art museum, and a field of grass. The grotesque, the ridiculous and the ironic vie for attention in each. But despite the fervor of each woman’s presentation, delivered in a kind of cell, with peeling revolutionary graffiti, a table, chairs, some water and that model (María Fernanda Videla Urra designed the set here, as well as Villa’s site-specific premiere in Chile), consensus eludes this tiny committee precisely because each proposal, even the most minimalistic, is loaded with emotional baggage. What must be said, remembered, saved? Is the point to forgive or to preserve? Is anyone willing to do either? They vote repeatedly, in a mock-serious simulacrum of the democratic process, but never arrive at a majority (for reasons that will be a surprise). Font gives us a fiery defender of catharsis through confrontation with the past; Finn’s Alejandra takes the opposite tack and seems the most human and trustworthy of the three; Stempel’s Alejandra is ambiguous and vaguely disturbing, in her preppy look, passionate argument for the white-box museum and provocation of the other two (the costumes, also by Videla Urra, provide finely-drawn cues to these anonymous women). Calderón throws his characters into a sort of Roman arena, where they are the victims and the lions both, and it’s great sport – because Calderón has a flair for mystery and suspense – watching their power struggle play out. It’s heartbreaking too, when some of those mysteries are revealed. Ariel Dorfman described Death and the Maiden, which outwardly grapples with victimization and forgiveness, as a work about “the stark, painful Chilean transition to democracy.” Calderón’s battle of wits in Villa is to be interpreted in a similarly figurative way; its emotional core lies not with the Villa Grimaldi (a symbol reduced to a tiny model) but with these women (underline, women) as the generation of Chileans who can and should determine its future course, one that must enshrine democracy in its decisions about treating the past but also in building the future. Villa is a subtle work of political theater by an exciting contemporary voice, and The Play Company’s Idea Lab gives its themes room to resonate for local audiences, with a program of post-show talks. On the night I attended, a discussion featured the playwright with three panelists working in different ways to preserve historical memory to fight future injustice. But however you read Villa, the play is a knock-out, and indeed memorable too, in its US premiere.